(A bis) Sketch A Shewing the progress of the Survey in Section No. 1 from 1844 to 1859. 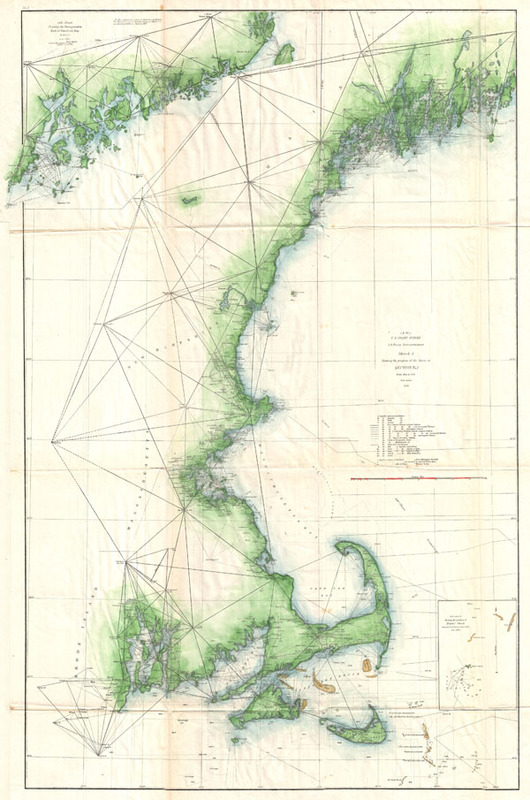 An impressive and striking example of the U.S Coast Survey's 1859 map or triangulation chart of the New England coastline. Covers the coast line from Narraganset Bay (Rhode Island) eastwards past Martha's Vineyard and Nantucket then north to Cape Cod, Boston Harbor, Cape Anne, Portsmith (New Hampshire) and Portland, Maine. Includes Boston City and Harbor, Salem, Provincetown, Cape Ann, Gloucester, Newburyport, Portsmouth and Portland, among other towns. A large inset map in the upper left quadrant focuses on Penobscot Bay. This chart was prepared under the supervision of A. D. Bache, one of the most influential and prolific Superintendents of the Coast Survey. Issued in the 1859 Superintendent's Report. Report of the Superintendent of the United States Coast Survey, (Washington) 1859. Very good. Minor toning and verso reinforcement and restoration along original fold lines. Else clean.